Dominick and Windy demonstrate how to assemble a Savvy Rest Serenity mattress. Harmful chemicals may be floating all around you. Here's what you can do to avoid them. Savvy Rest organic mattresses can be customized with combinations of Soft, Medium or Firm Dunlop and/or Talalay natural latex. This video explains. 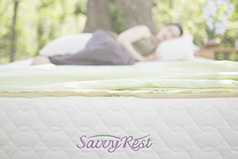 Find out how a customized Savvy Rest natural latex mattress can help. Need help choosing your natural latex layers? This video can help. Professional beach volleyball player Lauren Fendrick loves her Savvy Rest. Dominick describes the different benefits of our three organic mattress toppers. Struggling to find a comfortable sleep position? Dominick explains how a customizable body pillow can help. Dominick and Sheena describe each of our seven organic pillow styles.